I am VERY excited to be linking up with Sarah Ohm's 2015 Book Club. I missed January's selection (a motivational book) but plan on adding that to my March reading. 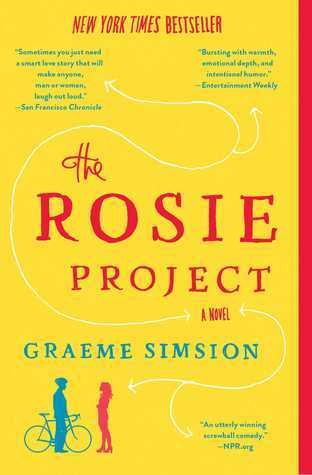 The theme for February's selection was a love story, so I went with Graeme Simsion's book The Rosie Project. An international sensation, this hilarious, feel-good novel is narrated by an oddly charming and socially challenged genetics professor on an unusual quest: to find out if he is capable of true love.Don Tillman, professor of genetics, has never been on a second date. He is a man who can count all his friends on the fingers of one hand, whose lifelong difficulty with social rituals has convinced him that he is simply not wired for romance. So when an acquaintance informs him that he would make a "wonderful" husband, his first reaction is shock. Yet he must concede to the statistical probability that there is someone for everyone, and he embarks upon The Wife Project. In the orderly, evidence-based manner with which he approaches all things, Don sets out to find the perfect partner. She will be punctual and logical--most definitely not a barmaid, a smoker, a drinker, or a late-arriver. Yet Rosie Jarman is all these things. She is also beguiling, fiery, intelligent--and on a quest of her own. She is looking for her biological father, a search that a certain DNA expert might be able to help her with. Don's Wife Project takes a back burner to the Father Project and an unlikely relationship blooms, forcing the scientifically minded geneticist to confront the spontaneous whirlwind that is Rosie--and the realization that love is not always what looks good on paper. "The Rosie Project" is a moving and hilarious novel for anyone who has ever tenaciously gone after life or love in the face of overwhelming challenges. I can't even begin to describe how much I LOVED this book. It was one of those books I put off finishing because I didn't want to the story to end. It's the story of Rosie and Don who are brought together by a misunderstanding. Both characters are equally flawed and totally relatable for their own reasons. I think my favorite review that read I saw before reading the book remained it "Sheldon Finds a Wife". It was fun, quirky and a refreshing perspective on love, romance and dating. This one had me laughing out loud more than once and on the verge of tears when things started to take a turn from the direction I wanted them to go.